You can use the Wholesale Order window to submit One Sided Trades on SGX. Prior to submitting a One Sided trade on SGX, users must be aware of the exchange regulations including minimum volume requirements and potential fees for late reporting. Note: One Sided Trades are only supported on the SGX_OTC Gateway. Prior to submitting a One Sided or One Sided Giveup trade, you should know the Counterparty’s Participant Code. 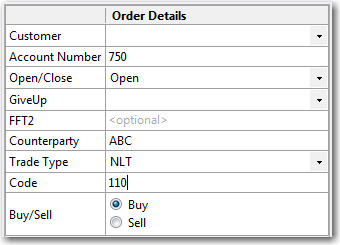 Verify that One Sided is selected in the Order Types pane and set the quantity and price for the trade. 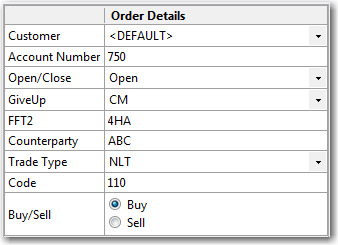 In the Order Details section, set whether this is the Buy or Sell side of the order and complete the remaining fields as listed below. Sets the user’s clearing account. This field is mandatory for all trades and the value is forwarded to the exchange API in the m_exchangeClearingAccount field. This field is mandatory when submitting a Giveup order and forwarded to the exchange API as part of exchange_info_s field. When submitting a Give Up, users must populate the FFT2 field. Sets the customer specific information. This field is mandatory for Give Up trades and optional for all other trades. This value, if present, is forwarded to the exchange API in the m_exchangeSubAccount field. Sets the Counterparty Participant Code and is mandatory for all One Sided trades and is sent as part of the ex_customer_s field. For Negotiated Large Trades, you must provide the Trade Report Code in the Code field. Required when the Trade Type field is set to NLT. This value varies by product. Refer to Trade Report Code for a mapping of values. When submitting a Negotiated Large Trade (NLT), you must populate the Code field using the trade report code. This value varies based on product as listed in the table below.